(Fantastic Four: Unstable Molecules#1 (fb) - BTS) - Susan and Jonathan Sturm were orphaned when their parents were killed in an auto accident in 1952. At the age of 19, Sue left college to care for her 8-year-old brother Johnny, and also became romantically involved with her neighbor Reed, who was nearly twenty years older than she was. (Fantastic Four: Unstable Molecules#1 (fb) - BTS) - Dr. Reed Richards developed the microprobe scope, through which he observed sub-atomic clusters which he hoped could one day be stabilized and structured as a polymer for industrial use. Dr. Victor Dunne, a member of his research team, claimed to be co-creator of the scope, which Richards contested. (Fantastic Four: Unstable Molecules#1 (fb) - BTS) - In 1957, Roy Coles, a cartoonist who lived near the Sturm family, became the artist for the strip Vapor Girl, written by Stan Lee and published by the Atlas line. He based the visuals for her on Sue, on whom he has a crush. (Fantastic Four: Unstable Molecules#1) - In 1958, General Nathan F. Twining enlisted Reed into the nascent space program to join Dr. Von Braun in Huntsville. Johnny and his best friend, Richard Mannelman, were tormented by a trio of older boys led by a bully named Mitch. Sue agreed, under pressure from Reed, to host a faculty social. (Fantastic Four: Unstable Molecules#2) - Sue and her women's circle (including Kay Coles, Roy's wife) engaged in a discussion of the novel Peyton Place. The discussion was cut short by a call from the police, informing her that Johnny and Richard were running wild through the streets and interfering with traffic. At loose ends, Sue brought the boys to the boxing ring owned by Reed's old college friend Ben Grimm. She engaged in banter with Ben and met his girlfriend Myrna, who was about her age. After she dropped Johnny at home, Sue went grocery shopping and had an encounter with a former high school boyfriend, Joey King, who was now a beatnik. Back at home, at the last minute she invited Kay Coles and her husband to the social. (Fantastic Four: Unstable Molecules#3) - Johnny and Richard, while fleeing from Mitch and his cronies, stole Mitch's car. The pair ended up following an impromptu party invitation to Southbeach Cove. There, Johnny had an encounter with Joey King, who flirted with him. Afterwards, Mitch and his gang tracked down Johnny and Richard and beat them up, solidifying Johnny's desire to escape Glen Cove. (Fantastic Four: Unstable Molecules#4) - Ben, having broken up with Myrna, sulked in a dive bar. Sue, lonely at the academic social while Reed was late, became increasingly drunk. Kay Coles brought her husband Roy and, at Sue's invitation, some co-workers of his (including Stan Lee and Jack Kirby) to the party. Ben arrived at the Sturm house. He and Sue, both drunk and lonely, began to kiss, and were discovered by Reed. Infuriated, Reed insulted them both and left in a huff. Joey King and his mates, accompanied by Johnny, arrived at the house. Johnny announced his intent to leave town and hit the road, a la Jack Kerouac, along with Joey. Ben and Joey got involved in an altercation, and Ben was ko'ed from behind by one of Joey's companions. Joey, Johnny, and the rest of Joey's friends departed leaving Sue alone. (Fantastic Four: Unstable Molecules#4 (fb) - BTS) - In 1961, Stan Lee and Jack Kirby published the first issue of Fantastic Four. As an inside joke, they based some of the characters on people they met at an eventful party, years earlier. Some of their villains were based on Richard Mannelman (The Mole Man) and Victor Dunne (Doctor Doom). Comments: Created by James Sturm (writer), Guy Davis (pencils, inks). (Fantastic Four: Unstable Molecules#2 (fb) - BTS) - The events of 1960 transformed Reed, Ben, Sue and Johnny into national heroes. (Fantastic Four: Unstable Molecules#2 (fb) - BTS) - Sue Sturm was director of Fantastic Four Enterprises, and approved all scripts and licensing associated with the Marvel Comics portrayals of the characters, and was also director of the Fantastic Four Foundation, a charitable non-profit. The end page of the third issue, however, suggests that Johnny stayed with Joey King. Richard Mannelman's memoir published in 1969, Hot Times and Hot Rods: My High School Years with the Human Torch, does not seem to dispel that impression. 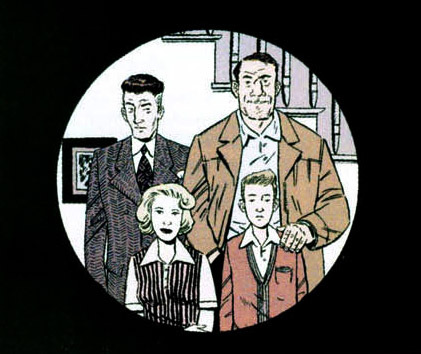 The end page of the fourth issue details the flash-forward in which the foursome's appearance in the comic is explicitly nothing more than an inside joke. Certainly the end of the comic itself, with Reed disgusted and isolated from his old friends and Johnny having abandoned Sue, supports that interpretation as well. It is possible that the first set of end pages refers to some alternate foursome similar to Reed Richards Rocket Group of Earth-8212. Fantastic Four, of Earth-523003 @ What If ...Dr. Doom Had Become the Thing? Fantastic Four, of Earth-Marvel Heroes Aged in Real Time @ Wha ...Huh? Fantastic Four, of Earth-President Andrew Jackson Had Taken Ben Grimm's Place in the Fantastic Four @ Wha ...Huh?